Distance from center of the femoral head to teardrop (or other identifiable landmark) should be equal bilaterally. The iliopsoas tendon should pass just lateral to the center of the femoral head and helps to keep the hip proper alignment. 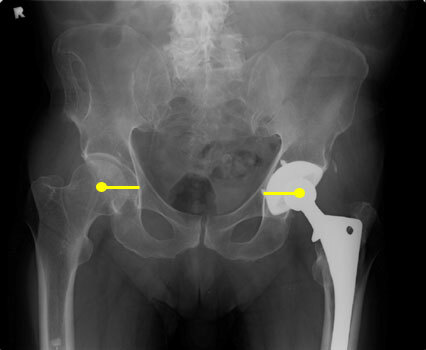 Excessive lateral positioning of the acetabular component results in the iliopsoas tendon crossing medial to the femoral head, placing the patient at risk for dislocation.